A solid regular season ultimately chalked up as a failure. That’s the only way to describe the underachievement last season was for the Spartans. This year’s squad returns a ton of veterans, players who’ve seen the struggles of D1 hockey and success leading up to heartbreak. They come back reenergized and as hungry as any team in the state. Coming back and aiming for more than just a #1 seed are seniors co-captain Adam Shea (11 G, 17 A) (CTHSHockey D2 Honorable Mention), Brett McNeil (13 G, 11 A) (CTHSHockey D2 Honorable Mention) and co-captain Keating Seymour (9 G, 8 A). Look for contributions from senior John Crocker and junior Zach Shelnitz as well. In net, the Spartans will have to rebuild. Graduated goalie and captain Nick Nuzzolo (CTHSHockey D1 Honorable Mention) is gone. He will be replaced by senior Brian Mosher, certainly capable, but only saw 10 minutes of game action last year. He will be aided defensively by a senior led group headed by co-captain Johnny Uscilla, Ryan Hauser and Scott Saffran. The pieces are ultimately there, but some would argue they were there last year as well. D2 is also a completely difference competition level than it was a year ago. The Spartans need to rally around the pain and shock that came in that 2-1 loss to Newtown in the first round of states and play angry, vindictive. I think they will and I think this will be a big year for Amity hockey. Arguably the best game of any division in last year’s state playoffs featured the Branford Hornets and could have been rewritten differently in the record books if a couple bounces went their way. In the semi’s on a cold night at Bennett, the Hornets fell to eventual D2 champ and 13 seed Fairfield Co-op in two overtimes, at the time seemingly an upset. The Hornets are among a cast of talented SCC D2 squads and will be lead this year by captain Rob Denhardt. 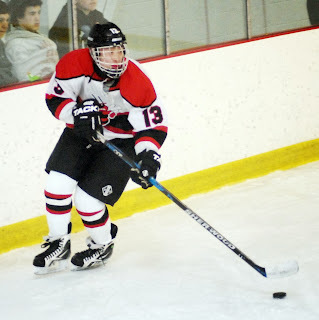 Offensively, you won’t see much drop off for Branford who returns plenty of weapons headed by leading scorer junior Tyler Criscuolo (20 G, 12 A) (CTHSHockey D2 Honorable Mention) and junior Tyler Hackett (18 G, 19 A) (CTHSHockey D2 Honorable Mention). Also coming back and expected to continue their growth are forwards Tony Pascale and Jason Vitale (only played half of last season). AJ Brink (CTHSHockey D2 Honorable Mention) platooned last season in net with classmate Alex Sarno. But Sarno is gone, headed to the Wolf Pack, so look for Brink to see the majority of action. Ryan Kallert will back up Brink and look to compete for playing time in net as well. Branford brings in a cast of newcomers that could push for extended minutes early. Brink is one of the best returning goalies at the D2 level and there aren’t many unknowns for Adolph Brink’s club. This is a team who ran off 12 wins, narrowly won the SCC D2 crown and was close to reaching the D2 semis. There is no reason to think they won’t repeat this success this season. They open the season with a grueling six game road stretch so that early season schedule will be vital to their success this season. Tournament Result: 3 seed- defeated (14) Farmington Valley in First round; defeated (6) Guilford 4-3 (2 OT) in Quarterfinals; lost to (2) East Catholic 6-1 in Semifinals. 2012-13 was an excellent first year at the D2 ranks for the IceCats of Brookfield-Bethel-Danbury. The co-op rambled off 14 wins and made it to the D2 semifinals. But even with all the good feelings out of BBD camp something seems incomplete. Last year made two years in a row that the IceCats bowed out in the semifinals. Narrowly missing a shot at a state championship should cause BBD to be even more hungry this year. The IceCats will be lead by senior captain Joey Britton, senior wingers captain Steven Almeida and captain John Vitti as well as junior Will Lawrence, certainly a player to watch heading into this season. Britton and Almeida have plenty of experience and will be relied upon direly while Vitti will do more of the heavy lifting in a bruiser type role both on D and offense. The IceCats lost three of their top four defensemen with the lone hangover being junior Eric Stoeckle who will look to be paired up with senior captain Kevin Keiser on the top pairing. In net things get interesting for BBD with the graduation of Luiz Dibble. As of now sophomore Andrew Diehl is slated to be the starter but is getting quite a push from fellow classmate James Van Tronk. BBD has been very successful each of the last two years, posting 14 win seasons during both campaigns. While I don’t see them matching that success this year with the losses of defenseman Scott Martin (CTHSHockey D2 First Team) and speedy winger Jordan Warren (CTHSHockey D2 Honorable Mention), I think this team has the potential to be successful. How successful, waits to be seen with big questions on defense and in net. Of note, junior forward Nick Rhode tore his ACL over the summer and will miss the season. The Cheshire Rams struggled to win close games at the Division I level last season. They now find themselves in the Division II ranks, a place where they hope to turn those 10 one-goal losses into wins. Coach Karl Sundquist had his heart ripped out many times last season, goalie Scott Romano stood on his head many times last season, yet the Rams couldn’t qualify for states. This year, the Rams return enough offense to have a shot at converting some of those close games. Senior Luke Vendetto (CTHSHockey D1 Honorable Mention) leads the squad along with stellar junior Ben Klanica, senior Joey D’Errico and senior Dan Purslow. In net, the Rams will look to a new face after a great season was turned in by Romano. Senior Joey Solla will look to take the D2 ranks by storm. Defensively, the Rams will not be nearly as strong as they were last year with the exits of Jake Nesdale and Tom DuPont. Following the model of other D2 SCC schools like Branford, Hand, and Amity, Cheshire has a blueprint for success. I just hope, for their sake, the move didn’t come a year too late, a year, say, they were rebuilding. The Chieftains of Conard crawled into the D2 state tournament last season only to fall to Newtown in a wild shootout 8-6 in the qualifying round. Coach Greg Raymer found something in his boys at the end of the season that caused them to go 3-1-1 over the last five games and clinch a playoff birth. Those three wins came against decent competition in East Catholic, Cheshire and Hall-Southington. While some familiar faces like Alex Bruttomesso (CTHSHockey D2 Honorable Mention), Zach Powers (CTHSHockey D2 Honorable Mention), Danny Kycia and goalie Charlie Fisher will not be there for Conard this year, there are some key pieces left that can at the very least replicate the “success” the Chieftains had last year. Offensively the Lacroix brothers return. Sophomore Grayson (CTHSHockey D2 Honorable Mention) and senior Quinn will lead an offense that will also look for contributions from senior John Palermo and junior Mark Ehnot. Jake Reynolds and Eric Krueger will look to bolster the blue line for the Chieftains this year. In net, it’s likely that a freshman could be stealing the reins as Zander Khan has really come on and looked promising early. Conard remains a holdover in a loaded Division II field and with the likes of Wethersfield, Westhill, Newtown, Stamford, etc. moving down, someone has to take their place. The Chieftans are hoping it’s not them but at least for the time being, I don’t see a return to states this year. Ken Mitchell takes over for the well chronicled anti-hero Ryan Hardy on the Tigers’ bench. This, is probably the biggest storyline for Hand this year as not much has changed in terms of personnel on the ice. Last year the Tigers were an anomaly on many nights, losing badly to teams they should play with and running away with games over some talented competition. When the Tigers were on their game, as evidence of winning the SCC D2 title, they were a tough out. Always an entertaining team (and bench) to watch, the Tigers saw 7 overtime games last year going 2-2-3 in those tilts. The Tigers return a poorman’s, SCC Division II, version of Toews and Kane in senior Dan Braumann (CTHSHockey D2 Honorable Mention) (16 G, 18 A) and junior Ben Solin (CTHSHockey D2 3rd Team) (18 G, 16 A) Solin missed some action last season with an injury and his absence was clear to see on nights he didn’t suit up. Mitchell also inherits one of the state’s best goalies in senior Chase Briggs (CTHSHockey D2 2nd Team). Briggs will man the pipes for the Tigers and can steal a game on any given night. They welcome a new face in sophomore Jeff Rider who can play both D and O and will be looked to aid the loss of freshman Sam Lafontaine (CTHSHockey D1 Honorable Mention) and seniors Matt Oman and Ryan Bell. It’ll be interesting early on to see how Mitchell gels with a group that shouldn’t need a ton of tweaking. No one will replace what Hardy had on the bench but early on, the reviews of Mitchell are very positive. Monitor this squad closely, they could be very dangerous. Coming tomorrow... Part II: Division 2 Team Preview Capsules!